Rejoice! (Intermediate Piano Solos). 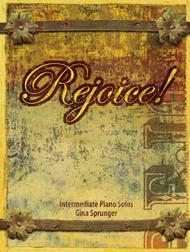 Composed by Gina Sprunger. Keyboard. For piano. Piano collection. Sacred. Intermediate. Published by SoundForth (S2.209494). Rejoice! composed by Jeffery L Ames. 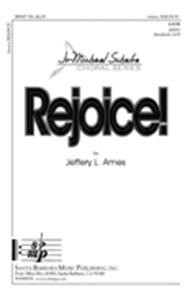 For SATB choir, piano. Jo-Michael Scheibe Choral Series. Concert. Medium. Octavo. Published by Santa Barbara Music Publishing (SB.SBMP-728).This one will bring the house to its feet, guaranteed. The composer is an expert in the gospel medium. Note: after the recording was made, the piece underwent some piano revision; ms. 107-115 are missing from the recording, as are the celebratory sounds during the piano interlude preceding these measures.